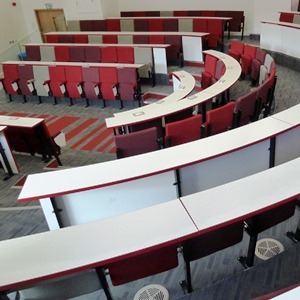 CPS Manufacturing Co has designed, manufactured and installed a large number of Harvard style lecture theatre seating at leading UK universities throughout our 52-year history. This particular teaching method was founded by the Harvard Business School over a hundred years ago and is still debatably the most effective way of increasing interaction between students and the lecturer. The well-known American school successfully demonstrated the ‘horse-shoe’ seating format to be an effective method of improving collaboration in lectures. The Harvard arrangement can incorporate either a CPS standard lecture seat or the Inova ‘turn and learn’ seating system can also be used. Early consultation during the design process is always highly recommended to provide the best possible solution for both the client and the architect to ensure the project is delivered on time and budget. CPS products are specifically designed and manufactured to withstand the rigors of extensive daily university usage. Our seating systems have been independently tested by FIRA to BS EN 12727:2000 and achieved the upper test, level 4 (severe category use). Our seating products also carry an industry unique lifetime warranty which offers an extra assurance on quality and durability to give you that extra peace of mind. We are always happy to answer any questions and would appreciate the opportunity to expand on the many benefits of the Harvard style and our other auditorium and lecture theatre seating options. A recent case study of a Harvard installation can be found here. Please do not hesitate to contact our seating expert Julian Ashmore on 01302 741888 or email us if you would like to discuss the popular Harvard style in more detail. From concept to completion we’ve got it covered.